1974’s Yellowstone Kelley (#7808) was one of my favorite Barbies to play with as a young girl. I loved her tan, her cute pink lips and pretty red, shiny hair! She remains a difficult doll to acquire. In fact, I’m on the hunt for one! Mattel used the very popular Steffie head mold for Kelley. She came with blue and white striped camping shorts and pants, a red and white dotted shirt and adorable knee-high socks with sneakers. Kelley also came equipped with lots of fun gear to go on her camping adventures; a backpack, yellow sleeping bag, camping mattress, camp stove, cooking utensils, pots and pans and a brush and comb because a girl can only “rough it” so much! Barbie dolls in 1974 were a shout-out to sports and physical activity. With the ‘76 Olympics just two years away and sports more popular than ever, Mattel created a Barbie sport series called the Sports Set. These dolls camped, sailed and skied their way into the hearts of children. There were only four sets of these active teens made; sailing Newport Barbie, skiing Sun Valley Barbie and Ken and camping Yellowstone Kelley. She was the only “new” doll in this line, as Sun Valley Barbie and Ken and Newport Barbie were 1973 Malibu dolls just dressed in sports fashions (sneaky!). 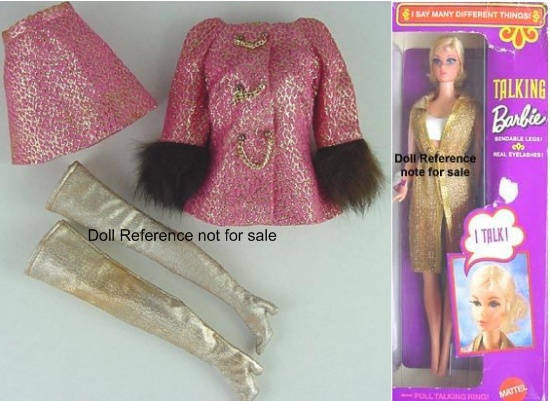 Barbie’s clothing in 1974 was influenced by the economic times and were less elaborate, featuring theBest Buy Barbie Fashions. Depends on who you ask, but many think 1974 was the last year of the “Mod” Barbie. I could also see it as 1972 or ‘73 when you consider their hairstyles and fashions. What do you think? So dolls… does anyone have a Yellowstone Kelley for sale? I’d love to add her to my ah-mazing Barbie collection! Barbie gained a new friend in 1972, Steffie. She had a gorgeous new head mold that has been used for numerous Barbie family dolls over the years. Walk Lively Steffie was brunette with brown eyes and had pretty rooted lashes. She came dressed in a pink and white print jumpsuit with a sheer pink scarf and red pilgrim shoes. What made Steffie unique is that when she is placed on her walk 'n turn stand and pushed along, her arms and legs move back and forth as her head looks from side to side! Walk Lively Barbie (#1182) and Walk Lively Ken (#1184) were also produced that same year in '72. Barbie's vibe changed in the early 70s and this was considered the era of "action," whether it was talking, walking or carrying accessories. This new level of articulation allowed Barbie to pose in a more realistic fashion. The Live Action dolls could dance, Busy Steffie could grab things with her newly-designed hands and this Walk Lively Steffie could strut her stuff! Moving bodies, extending hair, and a kissing mechanism were some of the added actions Mattel developed for Barbie dolls and her friends in the 70s. More examples of Barbies that could do things are Dramatic New Living Barbie, Barbie with Growin' Pretty Hair and Quick Curl Barbie. Some considered these types of Barbie dolls gimmicky and, I have to admit, I much prefer the dolls produced before the action era. They seemed to be of better quality and the fashions were much cooler! I love, love, loved the 1969 Fab Fur #1493 (fake fur, of course, Barbie loved animals! ), and 1969's Golden Groove with gold boots #1593. What are your fav Mod Barbie fashions?